Today I read some of the entries from the Industrial & Manufacturers Census Schedule for 1850 Bedford County Tennessee. The first listing is for a Nicholas Anthony--No known ties to my family but to me it is very interesting info that you can find in the non-population schedule that will lead you to other information. His listing starts: Nicholas Anthony Mill(Flour) Water powered with 1 saw. As a researcher it makes me wonder who he interacted with on a daily weekly or monthly basis. The entry also mentions what looks to be production of lumber or planks. There is a Nicholas Anthony in the 1830 & 1840 Census of Bedford Co Tennessee. It appears that the same Nicholas Anthony that is listed in 1830 and 1840 Census is also the one listed in 1850. In 1850 he is 70 years old born in North Carolina with a female in the household age 67 and named Sarah whose place of birth is also listed as North Carolina. Seventy seems kind of old to be running a mill but perhaps he is the owner and his son or sons run it for him. There is a North Carolina marriage for a Nicholas Anthony and an Elizabeth Nicholson with Jacob Anthony as bondsman in Guilford Co. NC on Oct 21, 1800. I wonder if this is the same couple or if Sarah is a second wife. 1840 Census has Anthony families with Head of Households named Jacob, Henry, William and Adam living nearby. A Nicholas Anthony is also listed in the 1850 Agricultural Non-Population Census for District 25 of Bedford Co TN. Also listed are Shofner, Low, Kimbro, Harrison and Landris families which are some of the same name who have been listed around him in previous census entries. I checked the Land Deed Genealogy of Bedford Co TN 1807-1852 by Helen C Marsh and Timothy R. Marsh and there are two listings for Nicholas Anthony on page 78. These entries are extracted information in the original Deed Book "M" pg. 105 and 107. The entries TN Grants No. 9587 and No 9588 both 15 acres each and dated Feb. 23 1813. Granted to Nicholas who is listed as an assignee of Benjamin McCullock. The land is on the waters of the Thompson River and both areas are noted as bordering the property of Peter Shofner. Are there any of your family listed in the Industrial & Manufacturers Census Schedule? Below is the link to a blank form where you can see the column headings. A lot easier to read the headings from the form than the ones on the images as they seem to be the worst part of the digitized images. To find out more information about what information is available on Non-Population census schedules see the National Archives . A search of the catalogs at Ancestry and FamilySearch will tell you what is available in their database for your particular area of interest. Ancestry.com is a subscription service but the library edition is available on-site at most public libraries. 1850 United States Federal Census [database on-line: http://search.ancestry.com/search/db.aspx?dbid=8054]. Provo, UT, USA: Ancestry.com Operations, Inc., 2009. Images reproduced by FamilySearch. Searched for Nicholas Anthony. Accessed January 28, 2017. Year: 1850; Census Place: District 25, Bedford, Tennessee; Roll: M432_869; Page: 266B; Image: 531 Original data: Seventh Census of the United States, 1850; (National Archives Microfilm Publication M432, 1009 rolls); Records of the Bureau of the Census, Record Group 29; National Archives, Washington, D.C.
1840 United States Federal Census [database on-line http://search.ancestry.com/search/db.aspx?dbid=8057]. Provo, UT, USA: Ancestry.com Operations, Inc., 2010. Searched for Nicholas Anthony. Accessed January 28, 2017. Images reproduced by FamilySearch. Year: 1840; Census Place: Bedford, Tennessee; Roll: 519; Page: 98; Image: 209; Family History Library Film: 0024543 Original data: Sixth Census of the United States, 1840. (NARA microfilm publication M704, 580 rolls). Records of the Bureau of the Census, Record Group 29. National Archives, Washington, D.C.
1830 United States Federal Census [database on-line http://search.ancestry.com/search/db.aspx?dbid=8058]. Provo, UT, USA: Ancestry.com Operations, Inc., 2010. Searched for Nicholas Anthony. Accessed January 28, 2017. Images reproduced by FamilySearch 1830; Census Place: Bedford, Tennessee; Series: M19; Roll: 174; Page: 130; Family History Library Film: 0024532 Original data: Fifth Census of the United States, 1830. (NARA microfilm publication M19, 201 rolls). Records of the Bureau of the Census, Record Group 29. National Archives, Washington, D.C.
Marsh, Helen C., & Marsh, Timothy. R. (1988). Land deed genealogy of Bedford County, Tennessee. Easley, SC: Southern Historical Press. North Carolina, Marriage Records, 1741-2011 [database on-linehttp://search.ancestry.com/search/db.aspx?dbid=60548]. Provo, UT, USA: Ancestry.com Operations, Inc., 2015. Searched on Nicholas Anthony. Accessed January 28, 2017. Original data: North Carolina County Registers of Deeds. Microfilm. Record Group 048. North Carolina State Archives, Raleigh, NC. Today I spent some time looking at online map collections which contained the areas in which my ancestors lived. These are just a few of the sites I visited. If your interest lies in other areas, use your favorite search engine and ask for Historical Maps for that particular area. You should get a nice list. Another strategy for finding cousins who have atDNA tested at Ancestry. For those that have taken the atDNA test at Ancestry.com and not gotten any Circles or maybe you have Circles but none for the ancestor you are wanting to research. When you are viewing documents that are attached to your ancestor in others trees look at the right hand column when viewing the document or picture. You will see the button that tells you who the doc or pic is linked to. Other ancestors or persons in or mentioned in the picture may be linked. Below that is a Saved By listing for other people who have saved that picture or document which should mean they are interested or related to the family in some way. Click on any of the Users. This should take you to their profile page. From there you should be able to toggle thru any kits you admin and check against the profile. You do this by clicking on the Hyperlinked word "your". See the arrow pointing to it in the image below(Edited for privacy). This doesn't always work and I think it is due to settings for the other profile if they privacy settings pretty tight. If any of the kits you admin match the main profile or any of the kit's for which that profile is the admin, those kits will show below the Main profile panel. It is important to note that Absence of a match doesn't mean that they tested and do not match it. It means there is no DNA available for that profile that matches yours. They may have tested and not match...or they may not have a test at all. When you do find a match though you can then click on it to go the Match page and look at cM amounts, projected relationship, tree, etc. I have been mapping my DNA segments to specific contributing ancestors for a little over 2 years now. It is something I really enjoy doing but at the same time, it can be very frustrating. When I first began I was the only one in my family who had tested. A few months after getting my results I bought a test for my Mom who agreed to test. This really helped when her results were in and uploaded with mine to GEDmatch as I was able to differentiate between matches which were on her side and those which were on my paternal side of the family. GEDmatch has a tool that is extremely useful if you only have one parent who is able to test. It allows you to use that parent's DNA to subtract the DNA they gave you leaving you with a Phased kit which containing just the DNA that the un-tested parent contributed. 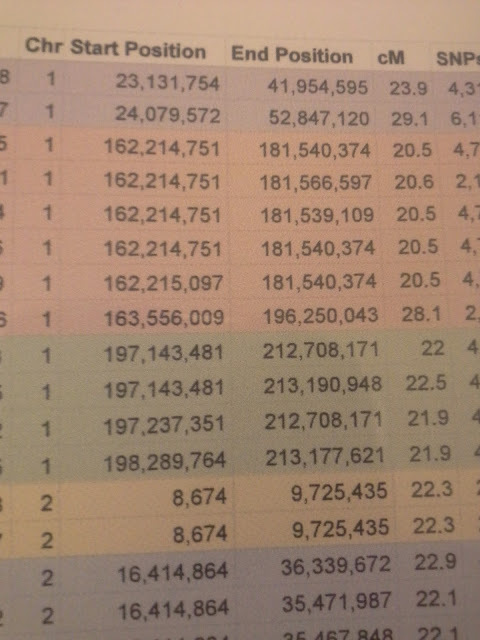 Last year my sister tested and her results came in which gave me more date with which to work. I couldn't have asked for better results. While she is a full sister she and I match at 2513.7 cMs(not including the X amount) which is on the low end of full siblings meaning we received varying DNA from our parents. I also created a phased kit of the DNA which she received from Dad and compared it to the phase kit of the DNA which I received. It has given me a pretty good visual phasing though it's not perfect you can see the re-combinations. I used this comparison to mark the segments where we were opposite and was able to narrow down some segments to PGM or PGF. Add a column on the far right of your Spreadsheet. This column will be used to identify whether the match or the match group is from the Paternal Grandfather or the Paternal Grandmother's lines. Once again while looking thru Probate Records of my Ogilvie line I have happened upon another file near it with a listing of book titles or types. This listing was a store inventory list which was part of the estate of John Wright of Williamson Co. TN(1809). I've copied the listing here and I'm sure there are spelling errors. I did alphabetize the list. Original data: Tennessee. County records. Nashville, Tennessee: Tennessee State Library and Archives. Microfilm roll numbers 99 to 108, 115, 336 to 337, 428 to 431, 519, A-4098, A-5278, B-1 to B-9, B-44 to B-127, B-314, B-441 to B-445, B-471 to B-473, B-1607 to B-1613, and B-1781 to B-1789. I have began working thru the probate records of my Paternal Grandfather's Ogilvie and Harris lines which come together at my 5th Great Grandparents. My tree is at Ancestry where I have tested along with my sister and my Mom. All of our DNA results are at GEDmatch as well. As I work and look thru hints I like to check the profiles of others who have linked to or uploaded information. When I visit their profile it also lets me check to see if there is a DNA match between me and that person. I can also select other tests I admin to see if any of them match. One of the good things about this is that if that person manages any other test and they match the test you have selected they will also appear beneath that profile, even if you don't match the profile but do have a match with one or more test which they admin. It's unclear to me when you don't find a match if it means they don't match you or if perhaps they haven't tested. At this point I only give weight to the matches...and not any additional when they don't because I don't know if they have tested. In this particular case my sister has the larger matches(17-20 cM segment) with both of these persons who tested and my Moderate match with the D.E. kit is only 6.6 cMs. Ancestry has put us all in the Ann Knox circle together. At this point there is not a Ogilvie or Harris Circle even though I do see descendants from at least 4 lines that descend from them working on trees. Likely not enough of them have tested or the ones that have tested do not have DNA in common. I contacted the main profile person and heard back from them within an hour(almost a record). Now here is where it gets tricky. The researcher has several tests at Ancestry(self, parent, sibling and maternal uncle) Along with the being included in the Ann Knox Circle for the testers profile, Shared Ancestor Hints for Jacob Sutton and wife Ann Knox are shown as well as William Ogilvie and Mary Harris. Since the Sutton/Knox and Ogilvie/Harris are on different sides of the main testers family we were able to determine that the match my sister has with her is likely Ogilvie/Harris. Looking at others who match at smaller amounts along the same segment and knowing the likely line, I have been able to find several others who appear to all have lineage back to this Ogilvie/Harris couple though I am still working on it. To add too this. The particular segment along which my sister(we are full siblings) matches is one which I and my sister do not have in common. For that segment I have matches which come from our Paternal Grandmother's side of the family This helps to know because it tells me if I match my PGM and my sister doesn't match me along that segment, that she got the only other segment that Dad could have given her....the one he got from his Dad, our PGF. This is why it is important to look at the matching segments rather than rely on the DNA circles. I cannot stress that enough. I feel like the best approach to the DNA circles is to work them looking over the matches and trying to get as many as possible that match you at large amounts to GEDmatch where you can examine them more closely and prove or disprove each of the matches for that circle. I've been working on my Ogilvie family a bit today, more specifically the family of William Ogilvie(1728-1813) and Mary Harris(1732-1807) who lived in College Grove, TN during the early 1800s. William and Mary are my 5th Great Grandparents. While reading thru the Ogilvie wills I noticed an inventory listing for a Jane Campbell from Williamson Co. TN just below part of the probate of Richard Ogilvie. I thought this was very interesting and have listed some of the items below. As far as I know she is a part of my family. Pg 33 Williamson Co Tn Will book July Term 1825 A list of articles belonging to the estate of Jane B Campbell deceased remaining unsold which according to law will be kept for the use of her children. also listed were 6 beds, bedroom furniture, kitchenware(pots pans and utensils as well as dishes) and of course.....bookcases. This inventory of the estate of Samuel Estes from Madison Co TN was immediately following some records I've been researching for a future blog post. I couldn't just leave it there without making note. From the Alabama Confederate Pension file of James Madison Justice. A letter from Geneva Co Alabama, Judge W. H. Morris recommending that the widow's pension be raised. I had to share because of the New Years wish which he included. Note that the letter was written on New Years Day of 1917. Original data: Texas, Confederate Pension Applications, 1899-1975. Vol. 1–646 & 1–283. Austin, Texas: Texas State Library and Archives Commission. Confederate Pension Rolls, Veterans and Widows. Richmond, Virginia: Library of Virginia Confederate Pension Applications, 1880-1940. Montgomery, Alabama: Alabama Department of Archives and History. Agriculture Schedule Entry for William Benton King my 2nd Great Grandfather. I know I complain about having trouble trying to contact DNA matches at Ancestry but I believe I've found a way that works pretty well. If your DNA match has a tree, comment on the ancestor of interest. I did this early yesterday morning and included my email address. Within 30 minutes I had 3 emails from cousins two of which had DNA tested off of that branch. One of the biggest headaches at Ancestry is trying to contact others. There really is no reliable way. Searches of Member Directory, Message System and AncestryDNA matches are all sketchy and almost never consistent. 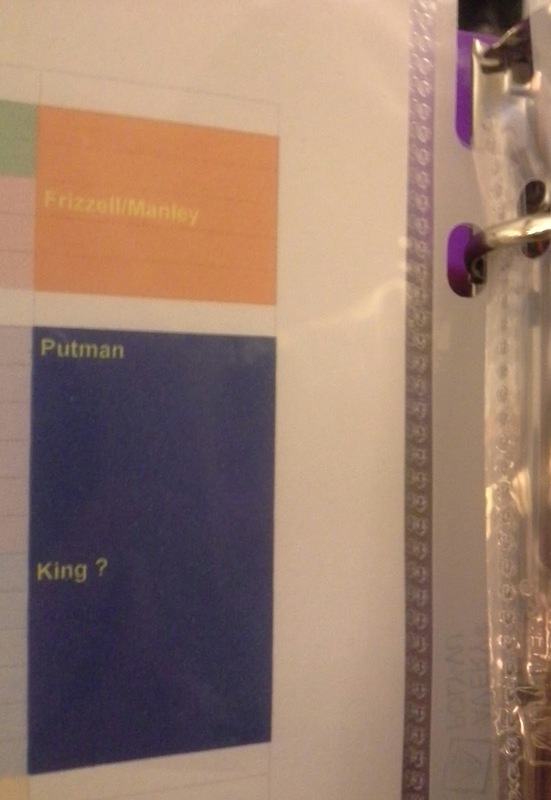 Sometimes the only way to find someone is to pick the oddest surname they have in their database and search on that. Why does commenting on a tree work better to get a response than trying to use the Ancestry Message system? I don't know for sure, but it may be that the email that is generated when comments are made doesn't have all the "clutter" that the other ones have. Also it helps that the comment is attached to the Ancestor of interest. I just know it has worked for me and I will continue using that when it is an option. If you try this, I'd love to hear your results. 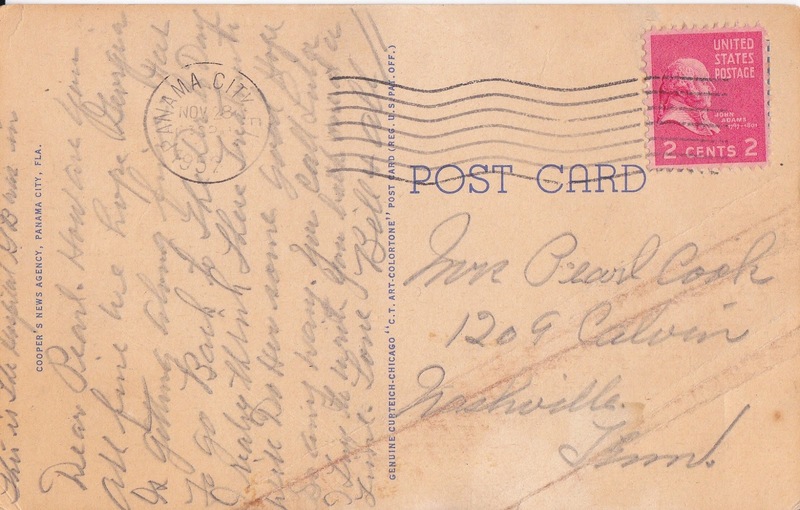 I believe this postcard is from Pearl's brother, William "Bill" Bryan Jakes, whose wife was Georgia B. Jakes. The Lula mentioned in the note is the sister of Pearl and Will. Address to Mrs. Pearl Cook 1209 Calvin (Ave), Nashville, Tenn. The holidays have been very busy and I wanted to write more about Flora but haven't had much time to research Flora's family. 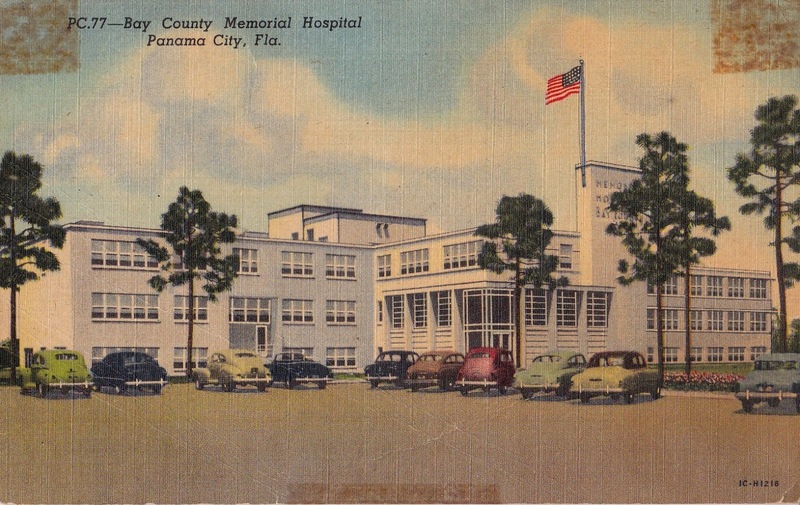 In previous posts covering this mystery I had mentioned that my Grandmother Pearl had traveled to the Navy Hospital(In Bethesda, MD according to the telegram) near Washington D.C when notified that her son, Morris was there. I've scanned and read over this post card many times over the years but I just now made the connection with the scene that is on the front. It is a picture of the fountain in Cincinnati Ohio. Odd that it wouldn't be something from Washington DC. 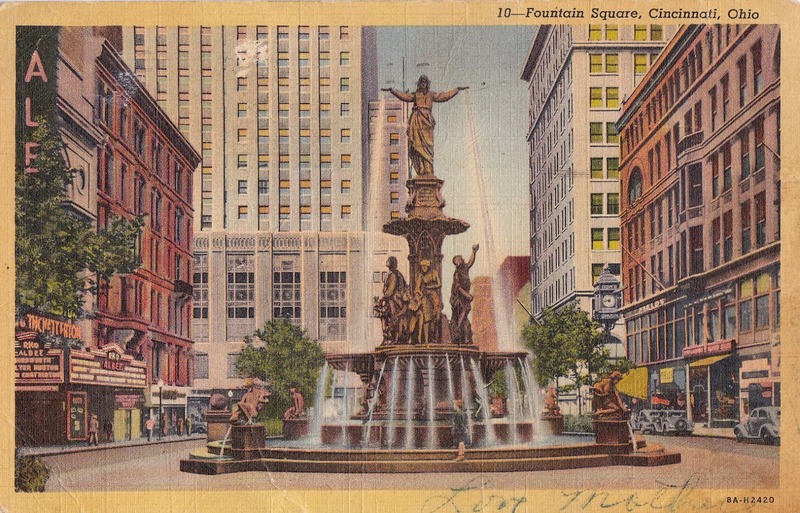 Did she stop over in Ohio and buy some postcards there planning to use them to write home. Was that how she met Flora...on the bus or train? 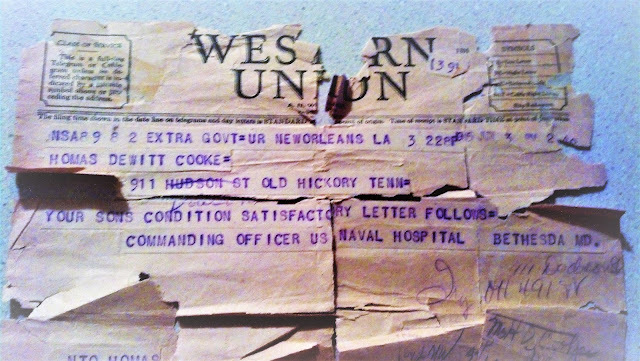 I have a photo of what remains of the telegram she received from the Navy. Which I'm posting here also. I guess the next step is to find any descendants of Flora and see if they have anything from those years which might over clues. My parents hadn't married yet so my mother wasn't around while this was going on. She did seem to think that one of Granny's nieces went with her...most likely Sue Bell Thompson--Papaw Cooke's niece(daughter of Rebecca L. Cook and Charlie Thompson). 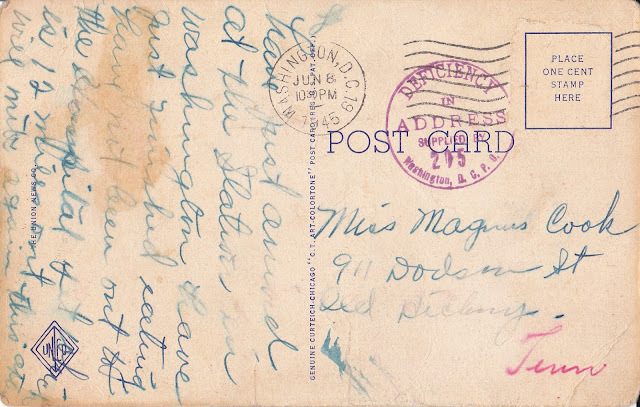 Postmarked Jun 8, 1945 Washington, D.C.
Below is a photo enhanced picture of what is left of the Telegram my grandmother received. I do not have a copy or know where the letter is that is mentioned in the Telegram.